We believe that offering competitive prices every day on quality products is the best way to bring value to you. Our customer service philosophy is the difference. We want you to be satisfied with your purchase because we want to be your trusted shopping destination. We strive to earn the trust of our customers. The next time you need help with a project around the farm or the house, the lawn & garden, or with your car, we have the experience and the products to get you going. You can always count on us! Gerald Edwards started his business career by purchasing the Cities Service gas station at 714 West McLane Street in Osceola in 1951, at the age of 26. He also ran a tank wagon service to various local customers. Besides gasoline, the station did minor service work as well as selling tires and batteries. In the mid 1960s he built a car wash and added camper rentals at the same location. He later acquired a competing car wash across the street where Rusty’s Auto sales and service is now located. In the early 1970s the two car washes were consolidated at that location, making way for the Osceola Farm and Home store adjacent to the gas station. Gerald, in partnership with Darrell Flaherty began Osceola Farm and Home in 1972. In 1975 he bought Darrell’s interest in the business and became sole owner. In the late 1970s the car wash business was sold to Tom Samuelson. In 1982-83 the original store was expanded to the south and more lines of merchandise were added. Around this time gasoline sales were discontinued and the old gas station was demolished to make way for an expansion of the small engine parts and service department as well as an expanded tire shop. In 1991 Gerald and three partners opened the Knoxville Farm and Home store at 2003 North Lincoln in Knoxville. Within a year he bought his partner’s shares and became sole owner of Knoxville Farm and Home. Gerald’s son, Patrick, joined the business in 1996 and in 2000, his other son Jeff joined the business. In April, 2001, at age 75, Gerald suffered a debilitating cardiac arrest which forced his retirement. Also in 2001, the brothers decided that Knoxville Farm and Home would benefit by a move to the south end of town near the newly completed Highway 92 bypass, and the business moved from its original 13,000 square foot location to the recently vacated 36,000 square foot Alco building at 1502 South Lincoln, across from the new Walmart Supercenter. Years earlier, Gerald had speculated that the Farm and Home business could thrive in close proximity to Walmart, and he was proven correct. With Gerald’s passing in February, 2004, Patrick and Jeff became co-owners of both businesses. The passage of time has necessitated modernization of the businesses, which has occupied the efforts of everyone involved. On October 26, 2014, an arson fire destroyed the original Osceola Farm and Home store. 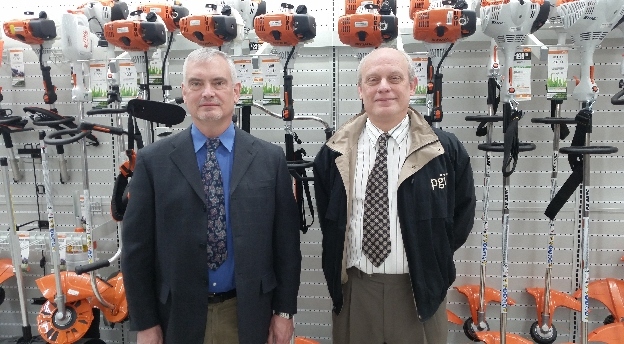 With the encouragement of the community, Patrick and Jeff decided to step up and build a new and improved store, larger in square footage and more complete in product lines. We are now situated in our new home and are very pleased with the results. We think you will be too. We invite you to stop in and see the progress we’ve made. It’s only the years of dedication and hard work from everyone on the team that has brought us to where we are today. We offer our sincere thanks to the community and our team for the success we enjoy.